Implementation of animation state support. Definition at line 52 of file llanimationstates.h. Definition at line 53 of file llanimationstates.h. Referenced by LLAgent::endAnimationUpdateUI(), and LLAnimationLibrary::LLAnimationLibrary(). Definition at line 54 of file llanimationstates.h. Definition at line 55 of file llanimationstates.h. Definition at line 56 of file llanimationstates.h. Definition at line 57 of file llanimationstates.h. Definition at line 58 of file llanimationstates.h. Referenced by LLAgent::clearAFK(), LLVOAvatar::idleUpdate(), LLAnimationLibrary::LLAnimationLibrary(), LLAgent::onAnimStop(), LLAgent::setAFK(), and LLVOAvatar::startMotion(). Definition at line 59 of file llanimationstates.h. Definition at line 60 of file llanimationstates.h. Definition at line 61 of file llanimationstates.h. Definition at line 62 of file llanimationstates.h. Definition at line 63 of file llanimationstates.h. Definition at line 64 of file llanimationstates.h. Referenced by LLAnimationLibrary::LLAnimationLibrary(), and LLAgent::onAnimStop(). Definition at line 65 of file llanimationstates.h. Referenced by LLAgent::clearBusy(), LLVOAvatar::idleUpdate(), LLAnimationLibrary::LLAnimationLibrary(), LLVOAvatar::LLVOAvatar(), and LLAgent::setBusy(). Definition at line 66 of file llanimationstates.h. Definition at line 67 of file llanimationstates.h. Definition at line 68 of file llanimationstates.h. Referenced by LLAnimationLibrary::LLAnimationLibrary(), and LLVOAvatar::LLVOAvatar(). Definition at line 69 of file llanimationstates.h. Definition at line 70 of file llanimationstates.h. Definition at line 71 of file llanimationstates.h. Referenced by LLAgent::changeCameraToCustomizeAvatar(), LLAgent::endAnimationUpdateUI(), LLVOAvatar::idleUpdate(), LLAnimationLibrary::LLAnimationLibrary(), and LLVOAvatar::LLVOAvatar(). Definition at line 72 of file llanimationstates.h. Referenced by LLAgent::endAnimationUpdateUI(), LLAnimationLibrary::LLAnimationLibrary(), and LLVOAvatar::LLVOAvatar(). Definition at line 73 of file llanimationstates.h. Definition at line 74 of file llanimationstates.h. Definition at line 75 of file llanimationstates.h. Definition at line 76 of file llanimationstates.h. Definition at line 77 of file llanimationstates.h. Definition at line 78 of file llanimationstates.h. Definition at line 79 of file llanimationstates.h. Definition at line 80 of file llanimationstates.h. Definition at line 81 of file llanimationstates.h. Definition at line 82 of file llanimationstates.h. Definition at line 83 of file llanimationstates.h. Definition at line 84 of file llanimationstates.h. Referenced by LLAnimationLibrary::LLAnimationLibrary(), LLFloaterAnimPreview::LLFloaterAnimPreview(), and LLVOAvatar::LLVOAvatar(). Definition at line 85 of file llanimationstates.h. Definition at line 86 of file llanimationstates.h. Definition at line 87 of file llanimationstates.h. Definition at line 88 of file llanimationstates.h. Definition at line 89 of file llanimationstates.h. Definition at line 90 of file llanimationstates.h. Definition at line 91 of file llanimationstates.h. Definition at line 92 of file llanimationstates.h. Definition at line 93 of file llanimationstates.h. Definition at line 94 of file llanimationstates.h. Definition at line 95 of file llanimationstates.h. Definition at line 96 of file llanimationstates.h. Definition at line 97 of file llanimationstates.h. Definition at line 98 of file llanimationstates.h. Definition at line 99 of file llanimationstates.h. 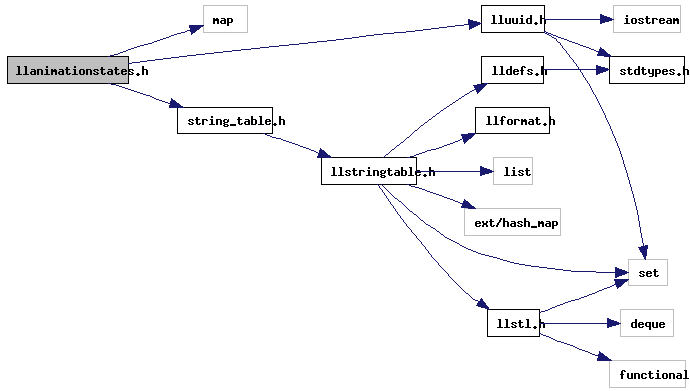 Definition at line 100 of file llanimationstates.h. Definition at line 101 of file llanimationstates.h. Definition at line 102 of file llanimationstates.h. Definition at line 103 of file llanimationstates.h. Definition at line 104 of file llanimationstates.h. Referenced by LLAnimationLibrary::LLAnimationLibrary(), LLFloaterAnimPreview::LLFloaterAnimPreview(), LLVOAvatar::LLVOAvatar(), LLVOAvatar::startMotion(), LLVOAvatar::stopMotion(), and LLVOAvatar::writeCAL3D(). Definition at line 105 of file llanimationstates.h. Definition at line 106 of file llanimationstates.h. Definition at line 107 of file llanimationstates.h. Definition at line 108 of file llanimationstates.h. Definition at line 109 of file llanimationstates.h. Referenced by LLPreviewGesture::initDefaultGesture(), and LLAnimationLibrary::LLAnimationLibrary(). Definition at line 110 of file llanimationstates.h. Definition at line 111 of file llanimationstates.h. Definition at line 112 of file llanimationstates.h. Definition at line 113 of file llanimationstates.h. Definition at line 114 of file llanimationstates.h. Definition at line 115 of file llanimationstates.h. Referenced by LLAnimationLibrary::LLAnimationLibrary(), LLFloaterAnimPreview::LLFloaterAnimPreview(), and LLFloaterAnimPreview::onCommitBaseAnim(). Definition at line 116 of file llanimationstates.h. Definition at line 117 of file llanimationstates.h. Definition at line 118 of file llanimationstates.h. Definition at line 119 of file llanimationstates.h. Definition at line 120 of file llanimationstates.h. Definition at line 121 of file llanimationstates.h. Definition at line 122 of file llanimationstates.h. Referenced by LLAnimationLibrary::LLAnimationLibrary(), LLAgent::onAnimStop(), and LLVOAvatar::updateCharacter(). Definition at line 123 of file llanimationstates.h. Definition at line 124 of file llanimationstates.h. Definition at line 125 of file llanimationstates.h. Definition at line 126 of file llanimationstates.h. Definition at line 127 of file llanimationstates.h. Definition at line 128 of file llanimationstates.h. Definition at line 129 of file llanimationstates.h. Definition at line 130 of file llanimationstates.h. Definition at line 131 of file llanimationstates.h. Definition at line 132 of file llanimationstates.h. Definition at line 133 of file llanimationstates.h. Definition at line 134 of file llanimationstates.h. Definition at line 135 of file llanimationstates.h. Definition at line 136 of file llanimationstates.h. Definition at line 137 of file llanimationstates.h. Definition at line 138 of file llanimationstates.h. Definition at line 139 of file llanimationstates.h. Definition at line 140 of file llanimationstates.h. Definition at line 141 of file llanimationstates.h. Definition at line 142 of file llanimationstates.h. Definition at line 143 of file llanimationstates.h. Referenced by LLAnimationLibrary::LLAnimationLibrary(), LLVOAvatar::LLVOAvatar(), and LLVOAvatar::updateCharacter(). Definition at line 144 of file llanimationstates.h. Definition at line 145 of file llanimationstates.h. Definition at line 146 of file llanimationstates.h. Definition at line 147 of file llanimationstates.h. Referenced by LLAnimationLibrary::LLAnimationLibrary(), and LLAgent::sendChat(). Definition at line 148 of file llanimationstates.h. Definition at line 149 of file llanimationstates.h. Referenced by LLAnimationLibrary::LLAnimationLibrary(), LLFloaterAnimPreview::onCommitBaseAnim(), LLVOAvatar::startMotion(), and LLVOAvatar::stopMotion(). Definition at line 150 of file llanimationstates.h. Referenced by LLAnimationLibrary::LLAnimationLibrary(), LLFloaterAnimPreview::LLFloaterAnimPreview(), LLVOAvatar::LLVOAvatar(), LLVOAvatar::startMotion(), and LLVOAvatar::stopMotion(). Definition at line 151 of file llanimationstates.h. Definition at line 152 of file llanimationstates.h. Definition at line 153 of file llanimationstates.h. Referenced by LLAnimationLibrary::LLAnimationLibrary(), LLVOAvatar::processSingleAnimationStateChange(), and LLVOAvatar::updateCharacter(). Definition at line 154 of file llanimationstates.h. Definition at line 155 of file llanimationstates.h. Definition at line 156 of file llanimationstates.h. Definition at line 157 of file llanimationstates.h. Definition at line 158 of file llanimationstates.h. Definition at line 159 of file llanimationstates.h. Referenced by LLAnimationLibrary::LLAnimationLibrary(), and LLViewerWindow::playSnapshotAnimAndSound(). Definition at line 160 of file llanimationstates.h. Referenced by LLAnimationLibrary::LLAnimationLibrary(), LLFloaterAnimPreview::LLFloaterAnimPreview(), LLPreviewAnimation::LLPreviewAnimation(), LLVOAvatar::LLVOAvatar(), LLAgent::onAnimStop(), and LLFloaterAnimPreview::onCommitBaseAnim(). Definition at line 162 of file llanimationstates.h. Referenced by LLAgent::fidget(), LLAnimationLibrary::LLAnimationLibrary(), LLVOAvatar::LLVOAvatar(), and LLAgent::stopFidget(). Definition at line 163 of file llanimationstates.h. Definition at line 164 of file llanimationstates.h. Definition at line 165 of file llanimationstates.h. Referenced by LLAgent::fidget(), LLVOAvatar::LLVOAvatar(), and LLAgent::stopFidget(). Definition at line 161 of file llanimationstates.h. Referenced by LLVOAvatar::LLVOAvatar(), LLAgent::onAnimStop(), and LLAgent::setFlying(). Definition at line 166 of file llanimationstates.h. Definition at line 167 of file llanimationstates.h. Definition at line 168 of file llanimationstates.h. Definition at line 169 of file llanimationstates.h. Definition at line 170 of file llanimationstates.h. Definition at line 171 of file llanimationstates.h. Definition at line 172 of file llanimationstates.h. Definition at line 173 of file llanimationstates.h. Definition at line 174 of file llanimationstates.h. Definition at line 175 of file llanimationstates.h. Definition at line 176 of file llanimationstates.h. Definition at line 177 of file llanimationstates.h. 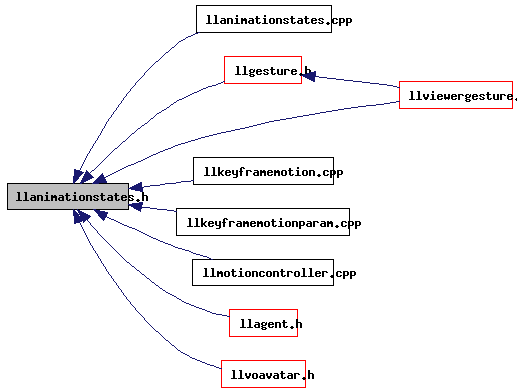 Referenced by LLAnimationLibrary::LLAnimationLibrary(), LLVOAvatar::processSingleAnimationStateChange(), LLAgent::startTyping(), and LLAgent::stopTyping(). Definition at line 178 of file llanimationstates.h. Referenced by LLAnimationLibrary::LLAnimationLibrary(), LLVOAvatar::LLVOAvatar(), LLFloaterAnimPreview::onCommitBaseAnim(), LLVOAvatar::startMotion(), LLVOAvatar::stopMotion(), LLVOAvatar::updateCharacter(), and LLVOAvatar::writeCAL3D(). Definition at line 179 of file llanimationstates.h. Definition at line 180 of file llanimationstates.h. Definition at line 181 of file llanimationstates.h. Definition at line 182 of file llanimationstates.h. Definition at line 183 of file llanimationstates.h. Definition at line 184 of file llanimationstates.h. Definition at line 185 of file llanimationstates.h. Definition at line 186 of file llanimationstates.h. Definition at line 49 of file llanimationstates.h.